Tomorrow, I'm returning to full time work after being a stay at home mom for over six years. In some ways, it seems like yesterday I was working at my last start-up. In other ways, I am a completely different person. My life, two children and one autism diagnosis later, is completely altered. And yet, inside, I am the same person. I need to bring that person into the light again. I am beyond excited about the change. But I am also incredibly anxious about what I am leaving behind. When I became a mother, I made a commitment to love and protect my children. How can I protect them from an office? How will I know that they are safe and happy, especially when one of them cannot speak? I always wanted my home to be the one the kids and their friends came to for parties and playdates. As it is now, regardless of my work, with Moe's full time therapy schedule, and our small Bay Area house, this isn't possible. I worry about losing my connection with both kids, but especially with Jelly, who will be entering kindergarten next year. Who will help her with her homework? Will I know her friends like my mom knew mine? Will I know what she is up to, especially now that the online world is so significant and much less visible. How will I know she is safe? How will I know she isn't being bullied? Or the bully? The recent suicide of young teen Rebecca Sedwick after being bullied by two girls, shows how easily parents can be disconnected from their children. So much so, that parents of one of the accused bullies has asserted that her account must have been hacked. This seems unlikely to me, but more and more, it feels impossible to truly know what our kids are up to. Their online personas can be so totally different from their offline ones. Obviously, I'm projecting. Jelly is only in preschool. Moe is home with very capable nannies and therapists. Jeff works just down the street. I know there are plenty of families with two working parents; it is probably more common than not in the Bay Area. I would never think a working mother wouldn't be as connected to her children as one who stays home. It will just be different. 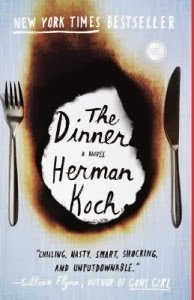 This post was inspired by The Dinner, a novel by Herman Koch. Two brothers and their wives sit down for a tension filled dinner to discuss a tragedy that can change both families’ lives forever. Join From Left to Write on October 29 as we discuss The Dinner. As a member, I received a copy of the book for review purposes.